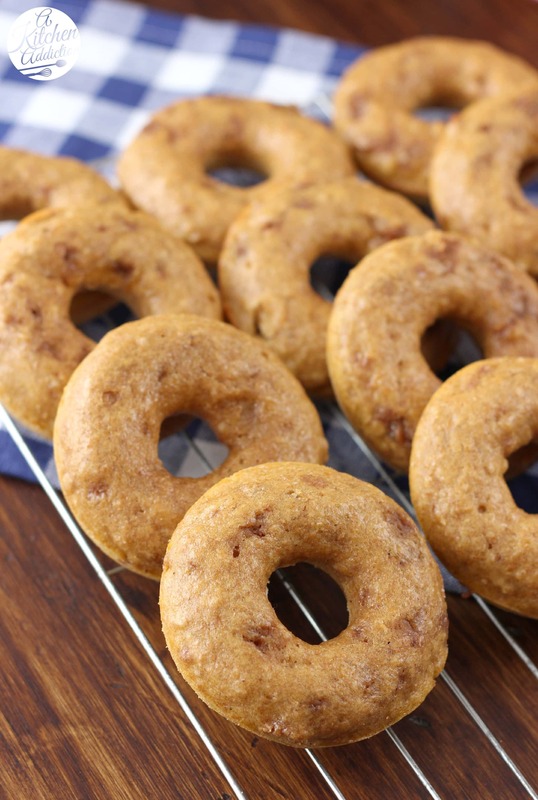 These easy, baked Pumpkin French Toast donuts have all the flavors of french toast! Complete with streusel pieces and an irresistible maple glaze! Fall has arrived! (At least for a little bit. . .) We went running in 60 degree weather yesterday and it felt so good! No instant sweating, no choking humidity. . .just crisp, cool air. Definitely excited about more cool runs ahead. Equally exciting is the realization that my house won’t heat up when the oven is on for more than 10 minutes. That is something to celebrate! With donuts, of course! A pumpkin donut with a hint of cinnamon, nutmeg and maple, studded with brown sugar-cinnamon streusel, and topped with a light maple glaze to be exact. What’s not to like?! 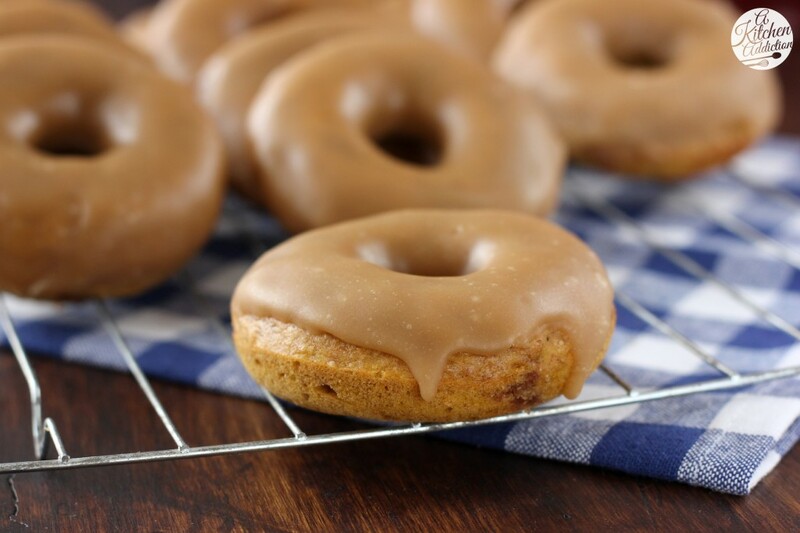 Pumpkin french toast donuts are the perfect way to welcome fall. Don’t be turned off by the longer list of ingredients. The streusel is worth it! It helps give the donuts the authentic french toast flavor. The light maple glaze on top is like the syrup poured over french toast. Just the topping to finish them off! Welcome fall, celebrate the weekend, or make them just because. Whatever your reason, these pumpkin french toast donuts are sure to make your day a little happier! Preheat oven to 350. Spray donut pan with non-stick cooking spray. In a large bowl, whisk together flours, sugars, baking powder, cinnamon, nutmeg, and salt. Stir in milk, pumpkin, eggs, butter, and extracts until just combined. In a small bowl, stir together all ingredients for the streusel pieces except butter. Cut in butter until mixture resembles coarse crumbs. (If you don’t mind getting your hands dirty, mix the butter in with your fingers and create bigger chunks of streusel.) Stir streusel into donut batter. Pour batter into a pastry bag or a ziploc bag with the corner cut off. Fill each donut cavity about ½ full. Bake for 9-11 minutes or until edges just start to turn light golden brown. Remove to a wire rack to cool for 2 minutes before removing from pan. While donuts are cooling, prepare glaze by melting together sugar and butter in a small saucepan over medium-low heat. Bring to a boil and allow to boil for 2 minutes. Add milk and boil for another minute. Add confectioner's sugar and maple extract and stir until smooth. Keeping heat on low, carefully dip each donut in glaze to cover tops. You may need to stir glaze occasionally to keep it from hardening. This is like two of my favorite breakfasts in one! With all of your scones and donuts, I wish you could make me breakfast every morning 🙂 I’m loving the cooler air to run in too…this morning it was in the 40’s on my run! I will definitely take solice in these donuts though… sound amazing especially with the streusel pieces instead to give it that extra french toast flavor. YUM! Pumpkin french toast donuts?! Hello, breakfast! These sound amazing, Jessica! Loce the fun flavor! Oh man these look and sound divine! I could eat a couple of these for breakfast any morning! I wish I could’ve had these for breakfast! I love all these fall recipes! This looks amazing!!!! mmm, so tasty! i am so happy fall is here. 🙂 almost! Oh what a heaven;y combo! I wish I could click my heals and a couple of these would magically appear in front of me!! Love love love these donuts! I am a sucker for streusel and love that you added them to these – such a great idea! 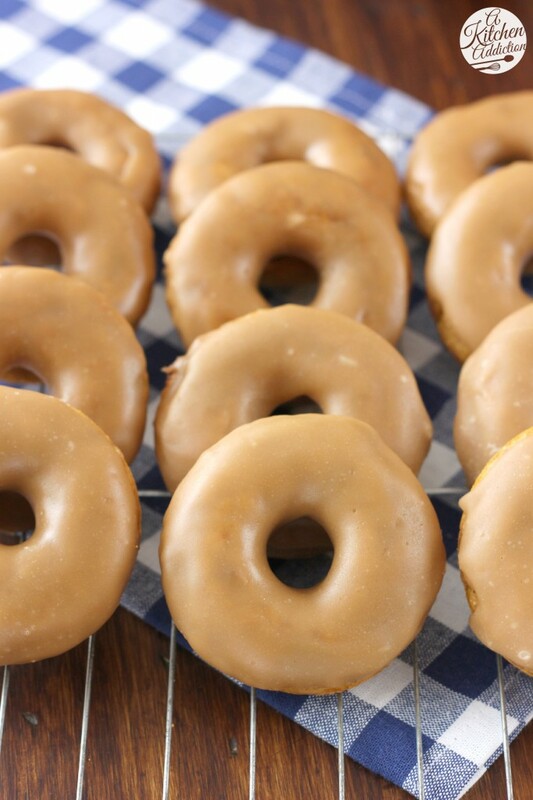 Pinning – the maple glaze looks mouthwatering too girl! You can use a muffin tin. Fill the cups about 3/4 full. You will probably need to bake them a couple of minutes longer. If you have a mini muffin pan, I’d recommend using that as the regular size muffins may end up being a bit denser. Hope that helps! Those look delicious!!! I’ll have to make them for breakfast one of these weekends… Can I substitute the maple extract with pure maple syrup? Streusel pieces in the donuts???? I love this! Love these! I haven’t been very adventurous when it comes to doughnuts, but I need to try them out some more! Now these donuts are so clever!! The look fantastic. Soooooo…. Breakfast tomorrow at 10 at your place? I’ll bring coffee you bring the donuts! These donuts look fantastic, and I love that they’re baked. It means I can eat at least 2 without feeling guilty…right? Bring on the Fall baking! What a fabulous combination! I could totally eat 5 right now! These look aMAzing! Can’t wait to try! What I want to know is on the glaze, how much butter? You have 1/4 butter. Is that tsp., cup, etc? I’m assuming cup. Thank you! Have to run out now and buy a donut pan! Didn’t know there was such a thing, and I bake fairly frequently, ha! Thanks for catching that! It should be a cup. Yes, you need a donut pan! 😉 You’ll love how easy it is to make donuts. 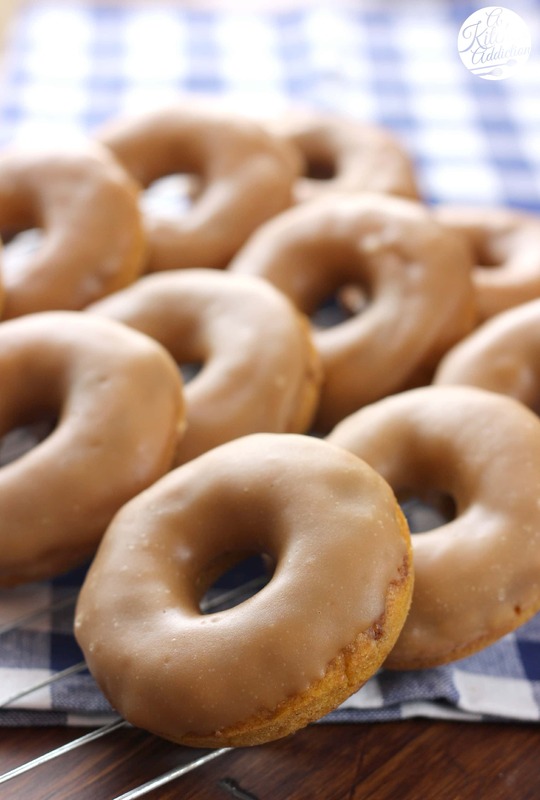 These donuts have all my favorite flavors – especially maple! 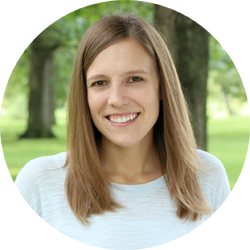 They turned out so beautifully Jessica – pinned! I feel like fall is finally starting to hit the great Northwest! And it is making me crave all things pumpkin. I’m gonna add this to my list of deliciousness to bake!! I’m wanting to try making these and I’m actually wondering if they can be made without a doughnut mold pan? In your directions you use it, but I don’t have one so I’m wondering what kind of consistency the batter is and whether it’ll stand alone without the mold. Thanks! I’m afraid the batter would be too runny to not use a doughnut pan. Sorry! Oh man. Looks like I found my recipe for our donut eating race. Is is as easy as it looks? I am a donut-making newbie. But a long-time donut lover. Can’t wait to try it and rate the recipe! And to think, I had a donut pan in my hand at the store today and then put it back. Gosh how I wish I would have purchased it now. I’ll have to go back and get it so I can make this recipe. They look amazing! !